Silver skin looks like strips of silvery membrane on the surface of meat cuts. It doesn’t break down when cooked, and can be unpleasantly chewy, so you should always try to remove it prior to cooking meat. 1. Poke the blade of your thinnest, sharpest knife (a rigid boning knife is an excellent choice) under the middle of a sliver skin strip, making a hole. 2. Pull up on the silver skin while pushing the knife forward, so that the tip of your knife comes out of the meat on the other side of the silver skin. 3. Twist the blade of your knife up, so that it is at an angle with the sharp edge facing both the silver skin and the direction you want to pull. This will minimize the amount of meat that is trimmed off. 4. Pull the knife towards one edge of the silver skin, so that it comes away in a long strip. Repeat with the other side of the silver skin. 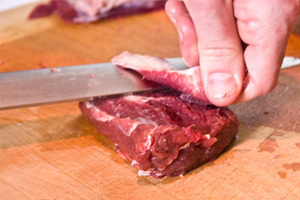 At first you may only get part of the silver skin to come off each time you do this, or you may accidently trim too much meat, but with a sharp knife and more practice, it will soon become easier.